The Supportworks Push Pier System develops a factor of safety against pier settlement by the pier installation methods used and the sequence with which multiple piers are driven and then re-loaded. 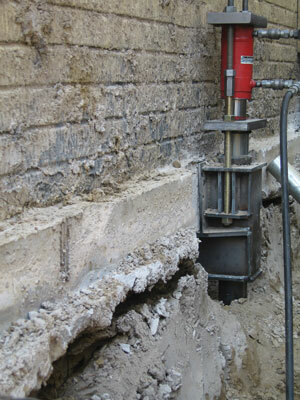 Piers are first driven individually using the maximum weight of the structure and any contributory soil load. After all of the piers are driven, the piers are re-loaded simultaneously, and the total reaction load is distributed over the multiple pier locations. Since the average load on each pier during the load transfer operation is less than the load during pier installation/driving, a factor of safety against settlement is achieved. Typical factors of safety against pier settlement range from about 1.5 to 3.0, with higher values generally achieved for structures with greater rigidity. These factors of safety conservatively ignore any additional long-term frictional component to the pier’s capacity (see below for more information). The first pier section advanced into the ground includes a larger-diameter "friction reducing collar" welded to the lead end. This collar, being larger in diameter than the pier tube, effectively creates annular space around the pier as it is advanced through most clayey soils. In soft clay or clean sand and gravel, an annular space may only temporarily be created. However, the larger diameter collar causes soil disturbance or remolding to occur, which also significantly reduces frictional resistance on the outside surface of the pier during driving. The result is a driven pier that generates most of its capacity in endbearing. Over time, the soils surrounding the pier relax back into the annular space and against the pier shaft. This provides an additional frictional component to the pier’s capacity. Even though this frictional capacity may be significant, it is conservatively ignored in the determination of the pier’s factor of safety against pier settlement.